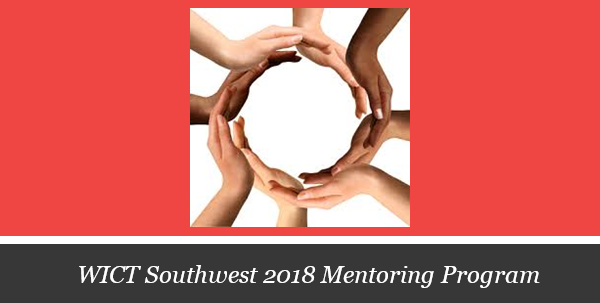 The WICT Southwest Chapter is pleased to offer the opportunity to join the Mentoring Circles program. The program has been used in other chapters with great success, including the success of our inaugural year in 2017. We are excited to bring it back to Southwest’s membership. LD Bennett will be facilitating the course, which consists of 6 monthly meetings of your Circle. LD has 30+ years of experience in the leadership development and organizational effectiveness. She leads leadership development, communications for corporate, nonprofit and federal agency initiatives. There is a time commitment as either a mentee or mentor. This includes a 3 hour kick-off program with all of the circles together in person June 27, followed by 90 minute sessions over lunch in July, August, September and October. Each month will require pre-work which is estimated to be 1.5 hours. The wrap-up in November will again be a longer session. Homework will be assigned each month as well. A new tool for this year is the Learning Management System (LMS), which will provide additional support materials to reinforce learning and application. Participants have unlimited access to LMS content over the program term. If you have interest in joining this mentorship program, please click on one of the application links below, depending on if you prefer to participate as a mentee or as a mentor.